A track saw is an excellent tool for accurately cutting and slicing sheet materials, while ensuring smooth edges with a quality finish. Their strength and versatility means that lumber and other materials can be cut too. However, which is the best track saw on the market today? Our top 5 table below will give you those details at a glance; for full reviews and a comprehensive buyer’s guide, keep on reading. While track saws may look like circular saws, (in fact 2 members of our top 5 are classed as circular plunge saws), their functionality goes far and beyond that of the standalone circular. The difference lies in the fact the blades on a track saw retract into a shrouded guard preventing the cut being made until you are ready. The operator simply releases the thumb lever, the motor assembly pivots to engage the blade, and the cutting begins. 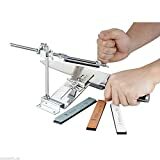 This enables the tool to plunge into the surface for cutting, or be used in a more conventional manner by being fed against the edge of the material. 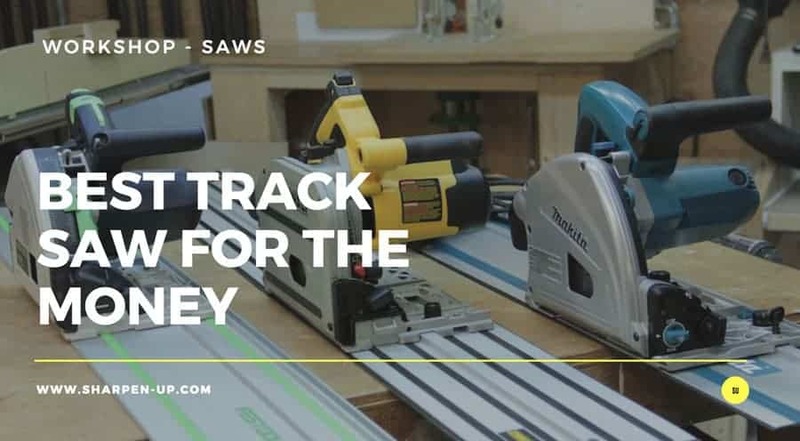 Ideal for flooring contractors or remodelers, as well as traditional woodworkers and home DIY, the track saw is a go to tool for many because of this increased versatility. First up is the obvious benefit of exact track alignment. This eradicates any guesswork, and to a certain extent some of your measuring tasks. You just need to align the track with your marks and then make the cut. Not only that, but the finished results are ultra straight. You are cutting in line with those tracks. Speak to anyone that owns a track saw, and you will hear the same thing; the accuracy of the tool is hard to beat. There is one undisputed fact when it comes to using a track saw over a circular saw: the cuts are cleaner. Whether you are feeding the tool through solid wood, plywood or MDF, the track saw cuts the material with very little compromise to the edges. Unsightly chip bits are a thing of the past once you’ve picked up and used a track saw. The tracks that you use with your track saw contain non-slip rubber strips on the base. This means you no longer have to mess around with clamping your equipment down. And while cutting without clamps can be disconcerting at first, you will soon get used to how reliable (and firmly fixed) your tracks are. The result? Well more time saved of course, and a better end result. It is possible to buy different length tracks with your saw, with some ranging up to 144 cm in length. However, there is no reason to stop there. Using connectors it is very possible to make super long cuts. The ends of the tracks are dead square, which makes locking them together extremely simple to do. The more track and connecters you have, the longer the cuts you can make it. Another benefit of opting for a track saw comes from the fact they are able to make big cuts in a small space. A table saw requires an infeed or outfeed space. Not so with the track saw. The more manageable nature of the tool, along side the ability to plunge cut materials, means you can slice up a full sheet of plywood in a room with dimensions unsuitable for the proverbial cat. Because the track saw uses a shroud to enclose the blade, it is also cleaner to use. The shroud acts as a dust guard. Many models will also allow a vacuum hose to be attached, meaning working inside the home is no longer an issue. All those messy particles are sucked away the instant they are shorn from the material. A track saw saves space in the back of the work van, and is also easy to carry around. It is possible to carry a track saw with one hand, with the tracks tucked under your arms. Imagine trying to carry the average table saw from job to job and you will realise there is no comparison. When placed into storage the tool doesn’t take up much space. It can rest in the corner of the workshop or garage, ready and waiting for the next time you need to use it. We’ve all been there with a table saw. To cut large heavy sheets of material it is necessary to rough cut this piece down with a circular saw, before carrying out the real finish cut with the table saw. With a track saw this is completely unnecessary. The precision, accuracy and versatility you have means that the first cut can be your final one. Not only that, but each piece (once you know what you are doing) will be as straight and smooth as anything you are likely to get from your very expensive (and rather bulky) table saw. 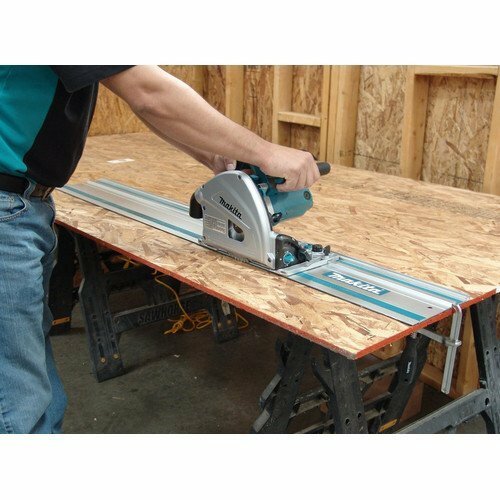 Can a track saw replace the table saw? So with all these benefits surrounding the track saw, is there any point in owning a table saw? 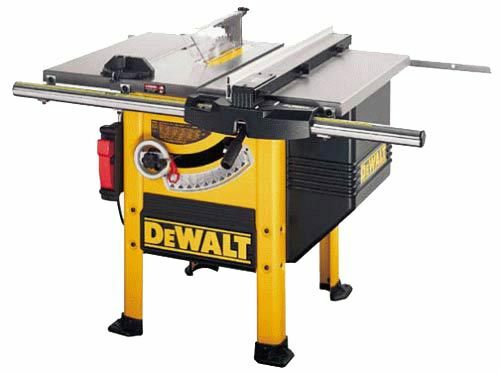 The fact is your table saw will not go into early retirement the minute you buy a track saw. A good workshop should have both. When dealing with smaller sections of wood, the track saw can feel clumsy to use. A table saw is much better for that. Additionally, the average track saw will not cut any further than 2 inches deep. 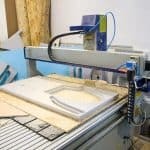 Owning a track saw will definitely see your table saw used less, however, when it comes to identical repeat cuts or working with smaller pieces of material, the latter will still be the tool of choice. 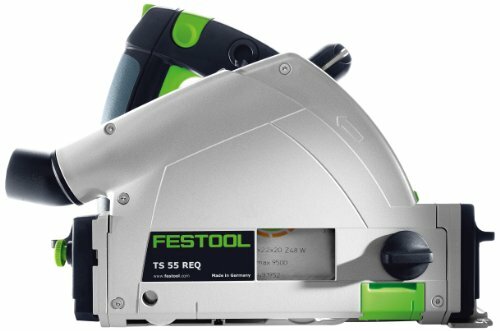 Festool are a brand with an excellent reputation in the power tool space, and their TS 75 EQ plunge cut will only add to that, it really is a formidable piece of equipment. 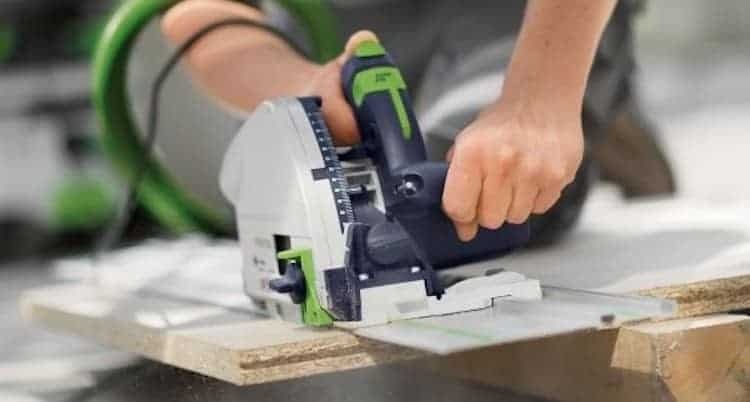 Combining the straight cut ability of the panel or table saw, along with the versatility of a portable saw, this Festool track saw (when used with the Festool guide rails>) received our number one pick because it ticks so many boxes. Under the hood you have an MMC electronic motor that features a soft start, (so the blade slowly speeds up as it makes contact with the material being cut), variable speed operation, (controllable from 1,350 rpm to 3,550 rpm) as well as constant speed under load. To ensure that there is no overload or heat-pressure malfunction, a current and thermal overload protection is built in as standard. The gear system is top quality too. Designed to help minimize the risk of kickback, a heavy-duty slip clutch takes up any potential strain. This also helps prevent wear and tear on vital components such as the blade, gear case and motor. The Festool TS 75 EQ Plunge Cut Circular saw also features a spring-loaded riving knife. This excellent addition is designed to keep the cut kerf open as the blade runs through the material. The end result alleviates any blade pinching, which makes for cleaner, straighter cuts, while again reducing the chance of kickback. There’s two maximum cutting depths depending on the configuration. Without the guide rail, the Festool will reach 2-15/16 inches (75 millimeters). Have the guide in place and you’ll have 2-3/4 inches of cutting capacity at your disposal. Depth adjustment is simple too; the tool allows you to expose only the part of the blade necessary for the cut. 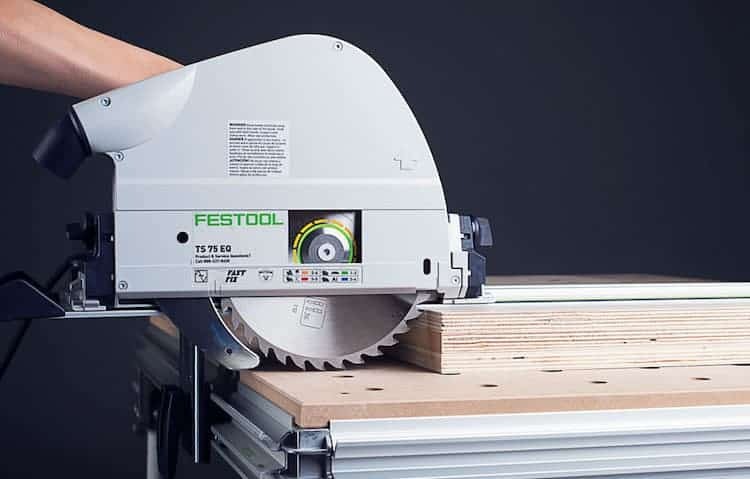 For fast and easy blade changes, the Festool uses a FastFix system. When engaged, the saw's power switch and arbor are locked simultaneously. This takes the stress out of the situation, there’s no chance of accidental start-ups. Furthermore, the saw is locked into a position for easy arbor bolt removal and simple access to the blade. And finally, while the TS 75 is not branded as a Festool Track Saw, the package ships complete with the 75 inch Festool guide rails as standard. Improved accuracy, with straight and level cuts utilising the Festool 75 inch guide track. Each cut is made one edge of the scribe line - even when creating bevel cuts. Cuts materials with burn-free and splinter-free edges - Creates a clean finish without any further prep work. FastFix Blade Changing System Saves Time - fast, easy, and intuitive. Robust Design Includes MMC Electronics – The TS 75 EQ offers variable speed control from 1,350 rpm to 3,550 rpm. Plug-It power cord - allows for quick switch between Festool tools without changing your entire setup. Backed by a three-year limited warranty and 30-day money-back guarantee. 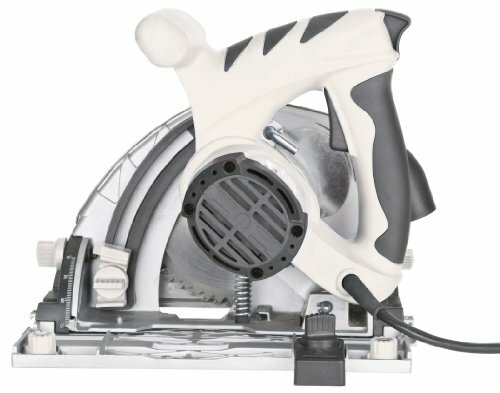 The Festool TS 75 EQ is more expensive than other track saws in our top 5. (However, you get what you pay for). 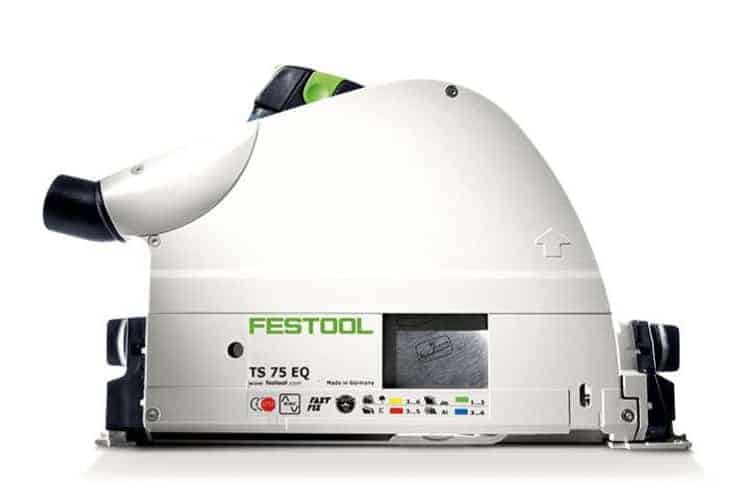 The Festool TS 75 EQ is a professional level piece of equipment that will not disappoint. Every aspect of the tool has been carefully designed for optimum performance. Build quality is superb, with each component constructed to last. In our opinion, Festool are manufacturing the best track saw on the market today. 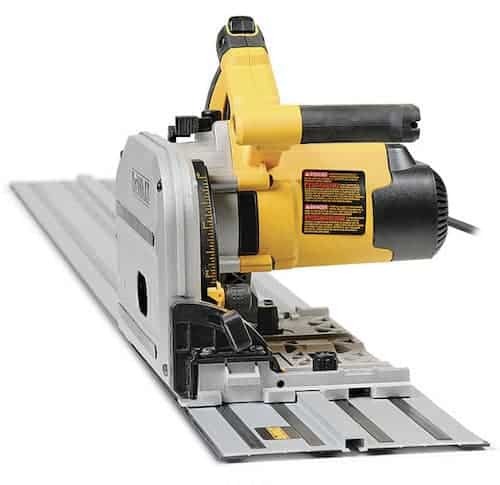 The DEWALT DWS520CK Track Saw is another high level addition to our top 5 track saw reviews list. Those familiar with Dewalt tools (beyond the bright yellow branding) will feel great the moment they pick this track saw up. Everything is reassuringly robust. The manufacturers have opted for a bulky design that can withstand the bruises of regular use. 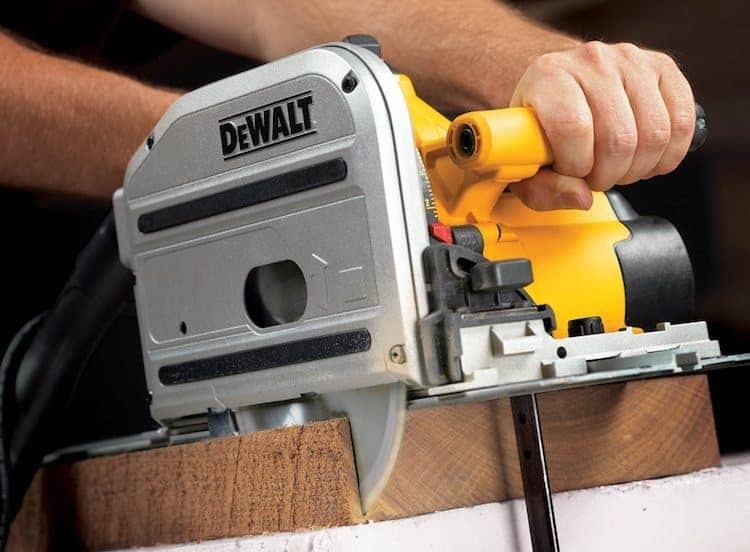 The Dewalt DWS520CK features a thick magnesium base with a pair of durable rubberized grips for the handles. There’s no mincing under the hood either. The tool packs an impressive 12A, 1300W motor. This bad boy will effortlessly cut through all manner of wood types up to 2-1/8-inch thick. Of course, as with the Festool Track saw, cutting depth is dependent on your configuration for the job in hand. When set up with the included guide track, the depth reaches that aforementioned 2-1/8 (54-milimeter) at 90 degree, while cutting at 45 degrees will give you a 1-5/8-inch (41-milimeter) depth. To take any of the guesswork out of the equation, the depth scale also indicates the exact depth while accounting for thickness of the track too. 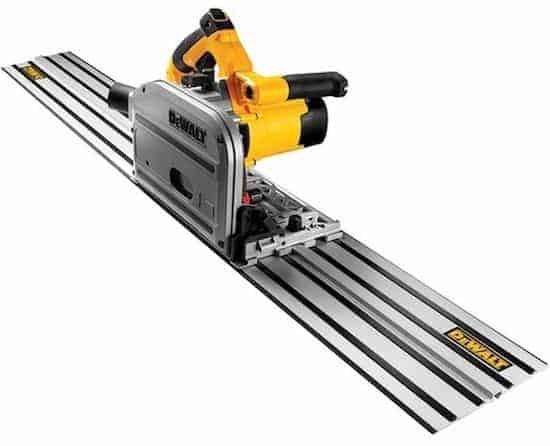 On the subject of the track, DEWALT have incorporated a zero clearance track saw cutting system. Not only does this deliver the precise and straight cuts you expect from a track saw, it also helps ensure, burn and splinter-free cuts. The system is also dual-edged making for straight cuts in both directions without the need for time consuming reconfiguration. 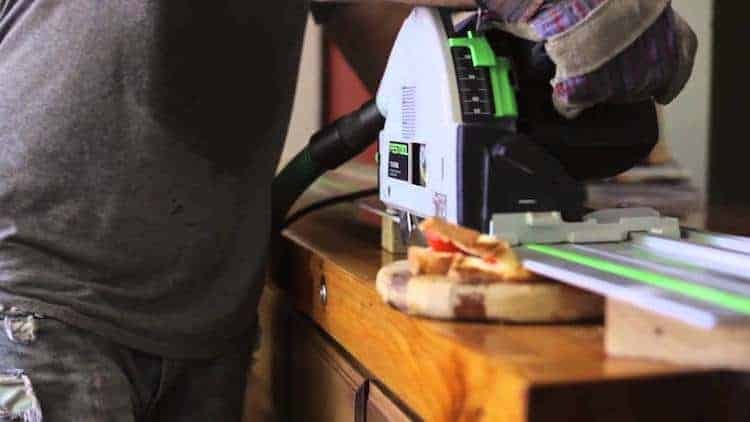 Anti-Kickback mechanisms are also in place, and in a similar vain to the Festool track saw, you also have a spring-loaded riving knife to prevent the material squeezing around the material as you cut. One feature that could be a little better thought is the blade-changing system. This actually involves a convoluted process of locking and unlocking levers to reach and release the blade, making everything a bit of a chore. Another great track saw from the ever reliable DEWALT. 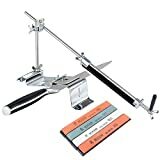 The addition of both a 59 inch and 102 inch track make this for an excellent package that will suit all manner of tasks for professional woodworker and hobbiest alike. While it doesn’t have the polish of the features you will find on the Festool, this is still more than worthy of your attention. Highly recommended. Makita are another brand that hardly need introduction when it comes to power tools. The company has an extremely consistent output of quality products. Let’s see if the Makita SP6000J holds up. Under the hood is another 12amp direct drive motor providing enough power to make short work of a wide variety of materials. This also includes a built-in torque limiter to prevent motor burnout. An inbuilt electronic speed control system is designed to maintain a constant speed even when the motor is under load. The result is smooth, burn free cutting. Variable speed application is nice and easy to activate, with the inclusion of a control dial. This enables the user to match the speed to the application, within a 2,000 and 5,200 RPM range parameter. Bevel capability is a real plus point on the Makita. Ranging between -1 degrees to 48 degrees, the tool includes positive stops at 22.5 degrees and 45 degrees. The Makita is also capable of close-to-wall cutting (11/16 inch). 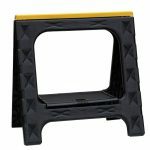 The built-in depth stop allows for a close cut of 1/16 inches to be made. 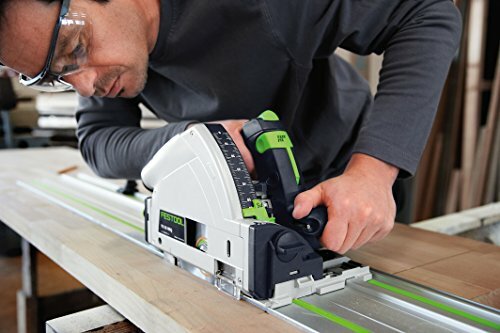 As with our top pick Festool circular plunge saw, when used in conjunction with the additionally purchased tracking guides, you can expect to carry out accurate, splinter free cutting over great lengths. 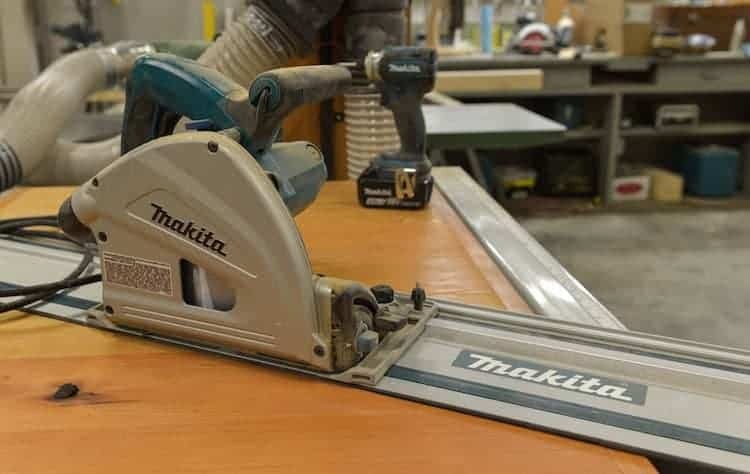 On the subject of the track rails, the Makita SP6000J features a lock lever that fixes the tool firmly to the rail system when positioned for a bevel cut. Makita offer a competitive warranty system too. If you are not satisfied within 30 days of purchase the company offer a replacement or refund. 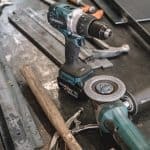 Furthermore, each tool to leave the Makita production line is warranted free of defects from workmanship and materials for one year from purchase date. 12 amp motor with slow speed start and built in torque limiter. 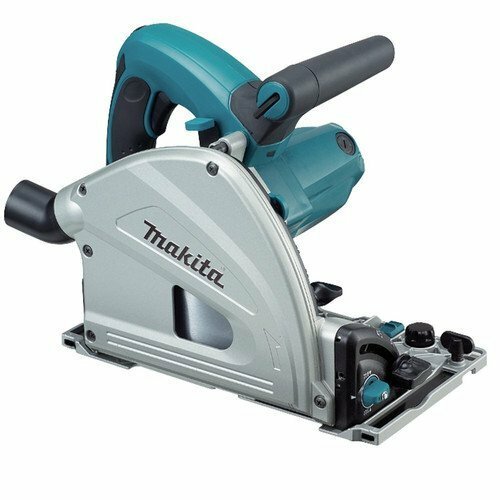 Although slightly more affordable than the higher rated track saws reviewed here, the Makita SP6000J still does an adequate job. That being said, the fact this tool does not perform as well as others in our list, combined with the issue that you have to go out and purchase the track guides separately, means it is not the best option. Research before you buy. Another Festool makes our best track saw top 5. And this one is actually branded as a Festool track saw. However, how does it stand up to our number one pick? (and our other track saw reviews for that matter). In many ways, the same features of the TS 75 make it onto the 55. We have the spring loaded riving knife designed to keep the cut of the material open so no blade pinch occurs, (limiting the risk of kickback and tardy results); there is also the FastFix easy blade removal system. Bevel cuts are smooth and simple with the Festool TS 55. The system tips from -1 degrees right up to 47 degrees, (just what the doctor ordered thank you very much). The plastic green splinterguard is also built to allow for a zero-clearance slot around the leading edge of the blade. The result is a clean, splinter free cut you would expect from a tool with this build quality. The tool ships with 55 inch guide track for those wanting the accuracy over long length cuts. Great dust extraction when used with the Festool Variable speed vacuum. Another great track saw from Festool. Not quite delivering the same overall performance as the TS 75, however this is still a great option for those looking for a versatile, well built tracking saw for their workshop. 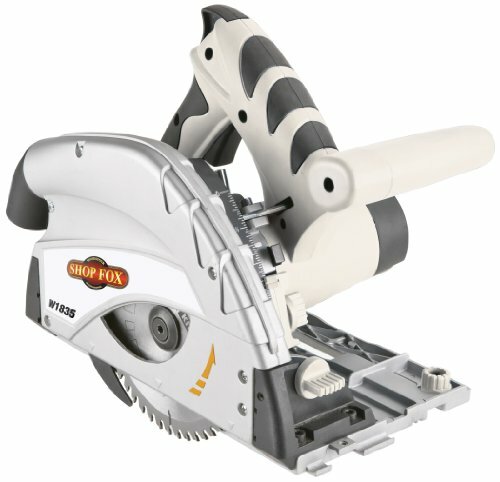 <a href="https://www.woodstockint.com/brands/shop-fox" target="_blank" rel="noopener">Shop Fox</a> are another brand that have a consistent output of quality products in the power tool arena. 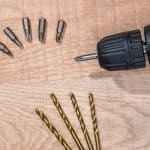 Many are pitched in the mid budget range, which is great for those wanting to broaden their range of workshop tools, while not necessarily remortgaging the house to do so. Let’s take a look at what you are getting with the Shop Fox W1835 track saw. First off, the 120 volt, 9amp (1.1 kW) motor is a nice level of specification to meet the majority of your cutting needs. With an RPM capability coming at 5500 there’s some speed under the hood too. This power leads to a overall blade rim speed of 9070 feet per minute. The saw also features a bevel gauge with lock, essential for carrying out those bevel cuts up to 45-degrees. The Shop Fox does not come with the necessary track guides as standard, (you will need to pick up the D4362 Shop Fox Guide Rail and D4363 Accessory Pack separately), however this does allow you to gradually build up the kit you need. (an indication of the brand’s look to consumer affordability). Once you have the full system in place, the track saw and guide rail combination makes for accurate, chip-free cutting results. That’s not to say you can’t get good results without the rails. 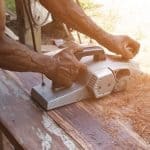 The plunge cut capability (with riving knife system) ensures that the Shop Fox is highly accurate while providing additional safety beyond that of the traditional circular saw. A rather nice feature of the W1835 is the 1-1/2-inch dust port for collection to a shop vacuum or dust collection system, (again something you can purchase separately at a later date if need be). The quality of the finish and overall functionality is not up there with the likes of the Festool. The Shop Fox W1835 is a great tool for those wanting a plunge cutting tool at a far lower price to the top end models we have reviewed here. However, to get the most out of this particular tracking saw you will need to buy extra gear. With that said, you can do all that and still not have a tool on the par with the Festool or DEWALT. Consider these pros and cons before you buy.